The full hybrid saloons are helping the business strengthen its environmental profile and meet the demands of customers who require prestige transport with greener performance. Heather Matthews, Managing Director, said: “The Lexus are the first hybrids we have used and we are confident they will add an important and attractive new dimension to our luxury vehicle fleet. “More and more of our clients place an emphasis on environmental performance and sustainability, issues that we can address with the highly efficient GS 300h. By running these vehicles we are also able to strengthen the ‘green’ qualities of our own operations. 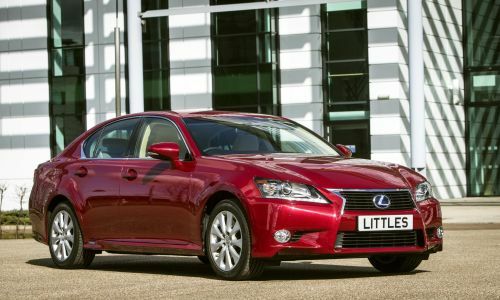 Little’s has chosen the SE version of the GS 300h, which comes as standard with dual-zone climate control, electrically adjustable seats, a 12-speaker audio system with DAB tuner, LED ambient cabin lighting and automatic headlights and windscreen wipers. The model’s full hybrid powertrain allows it to run in near-silent all-electric EV mode in slow moving city traffic, reducing tailpipe emissions and fuel consumption to zero. The new cars, arranged through Toyota and Lexus Fleet Services and supplied through Lexus Glasgow, are entering service with Little’s Scottish fleet. Established almost 50 years ago, Little’s has its headquarters in Glasgow but has an international reach, co-ordinating chauffeur services in worldwide locations. It specialises in corporate travel, including airport and rail transfers and event delegate transport for groups of all sizes. Its team is also experienced in the logistical organisation for single and multiple venue roadshows, taking care of all transport, luggage and passenger requirements. For leisure travellers, it is able to provide bespoke visitor itineraries for worldwide destinations.